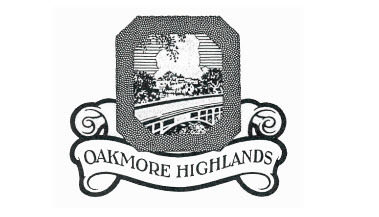 As described in the mission statement: The Oakmore Homes Association is a community of Oakmore neighbors committed to promoting and enhancing safety, beautification, community and property values in our neighborhood. Each part of the mission above has its roots in the history begun here by the Walter H. Leimert Company in 1926. See the topics below for excerpts from historical promotional materials and press reports of the time. From its inception, Oakmore was conceived as healthy and safe place to reside. It was designed to be a model modern community, which also implied ‘clean and safe’. Transportation needs and conflicts were considered early. 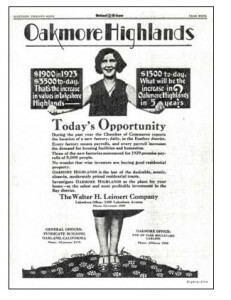 The Walter H. Leimert Company laid out the subdivision with wide paved streets and ample sidewalks. The Leimert Bridge was designed in 1926, by George A. Posey, to safely accommodate vehicle traffic, Park Boulevard Streetcars (Key System trolleys) and pedestrians. Looking down the road across the top of the Liemert Bridge. ~from the marketing materials of the Walter H. Leimert Company, c. 1926. The rolling his of the Oakmore district circa 1920’s. 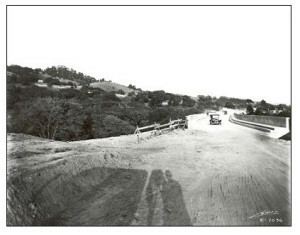 Iconic panoramic view of the Liemert Bridge circa 1926. Natural beauty abounds in the 150 acres of wooded, rolling hills that comprise the Oakmore District, or as Leimert called it, Oakmore Highlands. 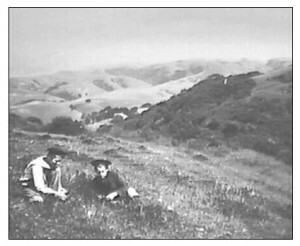 The original subdivision was bordered by Sausal Creek and Dimond Canyon (Willor Grove) on the west, by the creek bed of the former Palo Seco Creek (now the Warren Freeway-Hwy 13) to the east, by the grazing and farmlands of the Fruitvale Gardens district to the southeast, and the large holdings of Hugh Dimond (who called himself a “capitalist” in early city directories) to the south. To this day, the Leimert Company’s selection of these hills with their fabulous weather, location and views benefit all who live here. The company maintained a commitment to natural beauty throughout construction and considered it their “sacred obligation” to preserve the trees that inspired the first Spanish exploration party to christen the general area ‘ Oakland ‘. Walter H. Leimert and his son, Harry E. Leimert carried this high aesthetic standard into the architectural design of their subdivision as well. 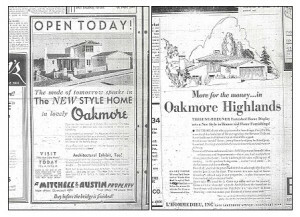 During the initial sales period, good design was promoted through a model open house program called the ‘Oakmore Home Ideal’ where buyers could visit a custom home designed by local architects Miller & Warnecke and discuss the construction with the contractors, in the hopes that this would stimulate sales and inspire the buying public to reach for a higher standard of excellence. 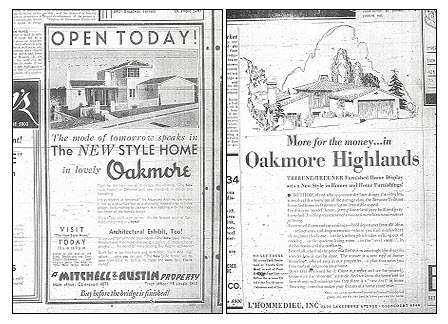 An original open house ad for the Oakmore development. 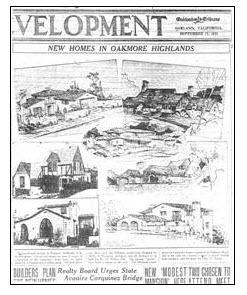 Later, in 1934, The Leimert Company teamed with the Oakland Tribune and Breuner’s Furniture Company to furnish a demonstration model home that drew 8,000 visitors in a three week period. The following year another Breuner’s furnished house was nicknamed “Golden Windows” to highlight the expansive use of glass on the view side of the home and the commanding views from the subdivision. The neighborhood went on to include houses designed by several of the leading architects of the period, including Miller & Warnecke, Chester H. Treichel and Guy Brown. The architectural styles range from Monterey Colonial to Mediterranean , Rustic Tudor and Spanish. Many of the homes we see around us today are also blessed with spectacular gardens which express landscape styles of the early century as well as the fruitful efforts of homeowners over time. The neighborhood we now call Oakmore was originally part of the 44,000 acre land grant made in 1820 to Luis Maria Peralta, a member of the de Anza expedition. It was to be his reward for a lifetime of service in Alta California to ‘Cross and Crown’. By 1842, when Peralta divided his lands among his four sons, the area surrounding Oakmore (which was in Antonio Marin’s share) was a thriving settlement of ship jumpers, lumber pirates and assorted adventurers. They were busily engaged in harvesting the giant redwoods of the Oakland hills and hauling them down 4th Avenue (now Park Boulevard ) to the estuary for sale. 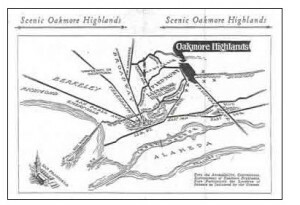 Original brochure map for the Oakmore Homes development. For decades, the Oakmore District remained an area of rugged and grassy hills, with canyons and lush creek beds cutting them off from the surrounding community. In 1926 the Park Boulevard Company, an association of land developers headed by realtor Walter H. Leimert, planned a residential development that was to be a model for its time. By constructing the Leimert Bridge ( Sausal Creek Bridge ) which they dubbed “The bridge that wrought a miracle for Oakmore Highlands”, they created access to these hills and created the neighborhood that is now Oakmore. Four tracts were included in the subdivision. There were a total of 440 lots, most zoned for single family residences, but some in the central section were zoned for multi-family and commercial. As the Leimert promotional materials said at the time, “For the convenience of the homeowners in Oakmore, a section of the subdivision has been set aside as a community business center. Here a model artistic business center is planned.” Property management and sales were handled by the company, Mitchell & Austin. It is believed that the first house to be completed was the Florence and Bestor Robinson House (Oct 1927) at the end of Bridgeview Drive . quoting Harry E. Leimert, V.P. 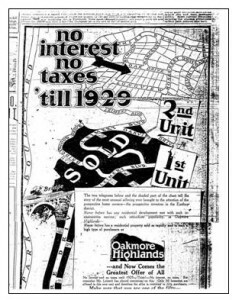 of Walter H. Leimert Co.
Advertisement for Oakmore Homes touting no interest and no taxes until 1929!! Grand Opening! Oakmore Homes development. The Walter H. Leimert Co. was quite proud of their new development. 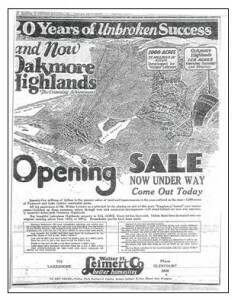 Leimert had recently completed the Lakeshore Highlands development and their company reputation was strong. Promotional materials for their new tract in Oakmore also aimed to be reasonable, emphasizing that, “Large lots, moderate prices and sensible building restrictions prevail”. It is said that prices in the “new residential park” started at around $2,000. The developers’ foresight, hard work and willingness to invest in infrastructure for the new subdivision created tremendous value here. 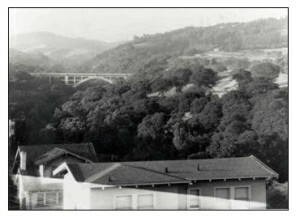 The builders, The Park Boulevard Company, also had the confidence and skill to construct the Leimert Bridge ( Sausal Creek Bridge ) across Dimond Canyon to access the Oakmore hills, thus creating new value in a place previously overlooked. Images courtesy of The Oakland History Room, Bosko Photography, The Oakland Tribune.